The rare 1973 Honda CB500 for Sale is in above average condition from what I've seen and rides and runs great. This CB750 has had the Carbs cleaned, plus new float needles and seats, has a 4 into 4 exhaust system and comes with a clean, clear title in my name. The CB500 has a new battery! All it needs is a a front brake hose and fork seal. The bike is jumping out of third gear so it will need some work to fix that but you could always ride it as is if you skip third. GoGoCycles would also encourage bikers to submit a review of this nice old old Honda motorcycle to make the biker community aware of any problems that are commonly associated with the 1973 CB 500 or to highlight its positive features and help potential buyers make informed decisions. If you have any questions about the 500 or would like to make an appointment you're welcome to email me and please mention that you found my classified on GoGoCycles Used Motorcycles for Sale when you call. 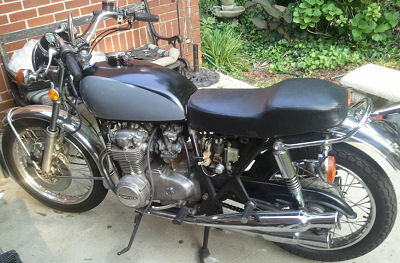 The 1973 Honda CB500 for Sale is located in Denver! Price $1900. Motorcycle license and cash in hand required for test rides.